Addis Ababa, December 12 2018- The African Union (AU) Commission Women, Gender and Development Directorate, in collaboration with the Solidarity for African Women’s Rights (SOAWR), the United Nations Office of the High Commissioner for Human Rights (OHCHR) and the United Nations Development Program (UNDP) is holding a High-Level Consultation meeting (12-13 December 2018) to accelerate the ratification, domestication and implementation of the Maputo Protocol and Celebrating the 15th Anniversary of the Maputo Protocol on 14 December, 2018. This three day event brings together various stakeholders to promote renew commitment in the universal and full ratification through the development of a Roadmap for the “All for Maputo Protocol Programme”, which is one of the key flagship projects of the AU Gender strategy, aiming at mobilizing support and funding as well as advocating for universal ratification of the instrument by 2020 while following up on its implementation and reporting. webDSC_0071Officially opening the high level Meeting, H.E Minata Cessouma Samate, Commissioner for Political Affairs, on behalf of the Chairperson of the African Union Commission, reiterated the commitment of the Chairperson to eliminate all forms of violence against women and the steps that the Commission and the Union are making towards Gender equality. She further emphasized on the Chairperson’s support to the process and his commitment to, through the Women, Gender and Development Directorate follow up on the key conclusions of the meeting to achieve the All for Maputo Programme. Mrs. Mahawa Kaba-Wheeler, Director, Women, Gender and Development Directorate (WGDD) of the African Union Commission (AUC), pointed out the importance for AU Member States, Civil Society Organizations, and partners to create a deep awareness on the relevance of the Maputo Protocol to secure the universal ratification before the deadline of 2020, remove of reservations, domesticate and implement the instrument in order to protect the rights of Women and Girls on the African continent. In her remarks, H.E. Commissioner Lucy Asuagbor, AU Special Rapporteur on the Rights of Women in Africa called for synergy in all member states to ensure ownership of various stakeholders in the process of ratification, domestication, implementation and reporting. 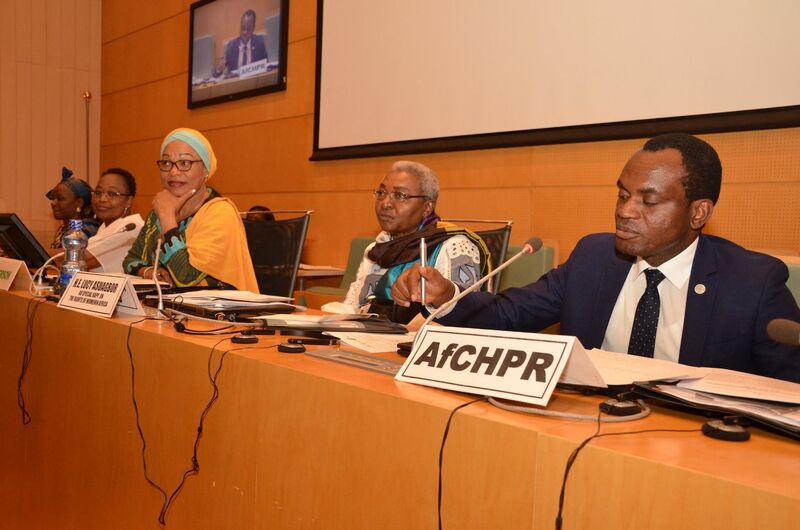 As she stated, after the adoption of the protocol in 2003, there was a momentum which was translated in the adoption of the Solemn Declaration on Gender Equality in Africa in 2004 and to encourage for member States to ratify the instrument before the end of 2005 for its entry into force. Therefore, “this Anniversary of the protocol should not go unnoticed and each and every one of us is an integral part of this celebration and should be part of the advocacy for its ratification”. She further called upon all stakeholders and partners to continue fight for Women’s Rights and the promotion of Women’s economic empowerment and political participation. In her capacity as chairperson of the event, H.E. Mme Helen Marie Laurence Ilboudo, Minister of Women, National Solidarity and Family, Burkina Faso and 1st Vice-Chairperson of the STC Bureau re-emphasized on the violence women are facing in the Continent and encouraged member States to identify bottlenecks that hinder full ratification of the Protocol and ensure Women’s rights are protected. She reiterated the need to not just the ratification but the implement the instrument in furtherance of actions that are already taking place at national level. This 3 days event will conclude on 14 December 2018 with as main highlights the press conference with the AUC Chairperson, H.E. Moussa Faki Mahamat, and the commemorative diner that will celebrate key achievements since the entry into force of the Maputo protocol and define the way forward towards universal ratification.